Email received 07/12/2018 from Lesley Miller in Australia - I first attended Upholland Grammer in 1973. Thought perhaps a school reunion may be a good starting point. web page. Brought back memories. Thanks for your time. Any old schoolmates of Lesley who wish to contact him please contact the website. Early this morning I received the sad news that my friend Alan Swift had peacefully passed away in his sleep after a long illness. I'm sure that Alan with his cheery and friendly nature will be remembered by many ex-pupils. In recent years we became good friends organising the 2014 reunion together, helping with the Jubilee celebrations at Winstanley College and representing Up Holland Grammer on the UGS Educational Foundation at Winstanley College. Dear all, On behalf of myself and my family can I say thank you for all the kind thoughts, texts and cards we have received this past few days. It is humbling to know how popular and well thought of my brother Alan was. The funeral is now confirmed to take place on Thursday 25th January, 1pm at St Aidens Church in Main Street Billinge followed by a celebration of Alan's life at Birchley St Mary's Club "Big room" Trent Road Billinge. I sincerely hope you can join us. Hi David - I'm very sorry to hear the sad news about Alan please do tell me what the funeral arrangements are. I would like very much to be there to represent Winstanley College as a thank you to Alan for all his warm hearted and jovial contributions to the life of Winstanley College. The UpHolland Grammar School Education Foundation will miss his contribution to the committee and I personally will miss his smiling face. It is a sad loss for all of us. Comments from other ex-pupils remembering Alan can be seen below. I would like to offer my condolences to family and friends on the sad demise of Alan Swift. He was our classmate at UGS and at the last reunion was still the enthusiastic, funny, happy person I remembered. R.I.P. Speedy and God Bless. Heather Burnley - Dear David, Thank you for giving me this terribly sad news. His passing will create a hole in many hearts, including my own. Gillian Miles (Darbyshire) - Dear David, - I was so sorry to hear the sad news about Alan. I knew he had been ill for some time but kept hoping that things would improve for him. Please accept my condolences on the loss of your friend and pass on my condolences to his family. David Noon RIP Alan (speedy) top bloke !!!!! Margy Horton David so sorry to hear the news about Alan. I remember meeting him at the Diamond jubilee and the reunion a few years ago. Such a happy cheerful guy. Stuart Cadman Really sad news. Speedy was a lovely guy. Margaret Cadman RIP Alan. Lovely gentle man. Nick Ellis From us too ....?. I recently received sad news that Yonne Gore has passed away. Yvonne was in the 1962 intake at UGS. We had been friends since primary school at Roby Mill. Please pass on my condolences to Yvonne's family - as you know we were both pupils at Roby Mill primary school and Up Holland grammar school. It seems like only yesterday that we were cycling around the village together and camping out overnight in the field behind her house - carefree days - hard to believe that it was over 50 years ago! I was so sorry to hear about David Atherton passing away. I had the pleasure of him being my A Level Economics lecturer from 1984 - 1986 (as did my sister, Heather, two years later.) Mr Atherton was a brilliant teacher and that A level course was so interesting. I went on to study Economics as part of my Business Studies and German degree. We both still rave about Economics A level to any student we come across. I went on to work at bæ systems as a buyer, living in Munich for ten years, and still enjoy working at the Warton site now. About two years ago my husband and I went to look around Winstanley College Open evening. My son didn't come with us at the time as he wanted to go to Runshaw with his friends. He has since transferred to Winstanley for his Upper Sixth year, to my great delight! After looking at the obligatory Maths, Physics and Computing Departments for my son, I was drawn to the Business Studies and Economics department and was in my element. I chatted away to the students and staff and mentioned Mr Atherton. To my immense surprise they told me that he still came into College some lunchtimes! I passed them my email address and asked them to get in touch with Mr Atherton for me. To my absolute delight he wrote back to me and astonishingly he remembered me and that I had studied German too. Impressive! I think this is a good thing that he remembered me!! It was 1986 when I left! He also went to the Houses of Parliament with my sister and she has fond memories of him too. I managed to exchange a few emails with him and he told me about his illness. David Atherton and Brian Jones (German A level at Winstanley) were the two best lecturers I ever had; the University ones did not come close. They both stood out for me as being able to inspire and teach so well, making their subjects fun and were mostly the reason I loved going to Winstanley! Best wishes to David's family and all those who will miss him. I have just seen a notice on Wigan announcements that Val Crawshaw (Simm)has died.She was in the 62 intake at UGS. Gillian Miles (Darbyshire) - Sorry to hear the sad news about Val, my condolences to her family. Extremely saddened to hear of the recent passing of Michael Longton. The ‘mathnificent seven’ on the photo was our Double Maths A Level class pictured at around the time we sat our exams in 1977. They are Mick Longton, Andrew Fielding, Duncan Kennedy, Alison Dagnall, Steve Hodge, yours truly and Mick Howard, sadly also no longer with us. We were a tight knit group. For two years we’d spent 14 periods a week together in the tiny rooms (C1 & C2 – the windows were frosted glass as they were actually changing rooms for the school productions) behind the school hall. especially any who may remember me. It is with great sadness that I have to report that our dear friend Anne Leather passed away yesterday. She was a lovely lady with a tremendous personality and she will be missed by her family and her vast number of friends. I knew her for less than two years but she had a significant effect on my life and I can only thank her for all the help she gave me in those years, and I will truly miss her. I spoke to her only last week in a long telephone conversation and she was chirpy and bright to the end. Some of you have known her for most of your lives and I know that this will be very upsetting. I am sure you have your own individual memories of this beautiful person and would like to pay your respects. One of Anne's last wishes to me was that the her October reunion go ahead as normal as she had devoted much of her time in seeing old school friends meeting up and discussing happy times. David Robinson will post any tributes sent to the site on the email/news page. Hope things are going well with you! I hope to be in Liverpool from 15 to 20 Sept 2015 and was wondering if there would be a chance to meet some of the 1966-69 Upholland classmates. I know it is a bit of a long shot but thought I would try my luck. Email received 23/3/15 from Phil Rickman. - Really sorry to hear about Reg. At the age of 11 I hated him on sight - never forgot that evil Dalek voice. Five years later, trying to teach me history, he was a great bloke. Never lost his temper, treated us like equals. Congratulations to Ray Guy from the 1961 intake who was recently awarded the MBE. Email received 8/7/14 from Kate Bainton nee Taberner. I came across your website and would be interested in finding out more about the group. I was at UGS from 1965 – 1972, name was Kathleen Taberner, although everyone knew me as ‘Kayt’ – the weird spelling stuck with me all the way through school but was ditched when I went to Leeds Uni and I decided I needed to adopt a more ‘grown-up’ persona! I now live in Bucks but as my mum still lives in Orrell I come up every few weeks. with links in the Up Holland, Orrell, Billinge district. They are Wilf Birkett, John Barton, Dave Gaskell and Harold Lea. All I know is that the table I made is still in my mother's home! Anyone with photos or anecdotes please contact the website. It's with great sadness I have to inform you that Tommy Derbyshire passed away Sunday 16th June 2013. Tommy was in the 1961 intake at UGS and I'm sure would be known by many ex-pupils who were at school in the early 1960's. Tommy was a great character at school and when I became reacquainted with him in recent years became a close friend. Tommy had a great memory of people from school and could tell you the birthdays of many old schoolfriends. He attended the 2005 and 2010 reunions and helped me with the organising and running of both. Steve Clarke - That is a tragedy. Tommy was a lovable guy and always up to mischief. He had a great laugh and a good old timers view of the world. He will be mourned by many I'm sure. remember him at the reunions as still a great character.If you are in contact with his family please pass on my sympathy to them. Phil Rickman - Oh hell. I knew he hadn't been well for quite some time, but that's still a shock. Tommy was that rarity, a hard kid who was also funny. Les Alker - I'm so sorry to hear the news about Tommy. Phil Banks - I'm sure many of us will be sad that he is no longer with us. As you are probably aware, Tommy and I were also at Lamberhead Green infants/junior school together before UGS. Ray Guy - I have lot of memories about Tommy please convey my condolences to his family. Christy Taylor (Seddon) - Very sad to hear the news of Tommy. Please convey sympathy to his family when you speak with them. Rhona Schofield (Johnston) - Really sorry to hear about Tommy’s passing, thank you for letting us know. He was one of those characters you never forget – I can still see him on our first day at UGS in the same class as me - 1E with Mrs Ellison. It was good to meet up and chat with him again at the 2005 reunion. Please do pass on our sincere condolences to Tommy’s family. ﻿Alison Wheeler (Gill) - Very sorry to hear this sad news. I remember Tommy at school and as you say he was a great character and I remember his friendliness at the reunions. ﻿Trevor Hughes - Sad news, Of course I remember Tommy tho I haven't seen or heard from him since UGS - dear God, it seems so long ago (probably because it is so long ago ). I would appreciate it if you would pass on/notify any of Bill Harrison's class mates of his recent death. After school Bill worked for a bank, owned a fishing tackle business and later went into teaching, in the Wolverhampton area. All through his life Bill had a passion for fishing. In fact it was at Writington Fish Ponds that Bill and I first met when he was about 12 years old, even at such a young age he would often out fish the senior anglers at the pond Throughout his life Bill would always go out of his way to help others and to support his friends in times of need. He was a real gentleman. Hi David, sorry to be the bearer of sad news but heard that Susan Bamber passed away yesterday.Thought you might like to know. Congratulations on the new web site, great format. Email received from David Jones, 10/08/2012 - I went to U.G.S '39 to '44. Great new website. All power to your elbow. Some sad news however. 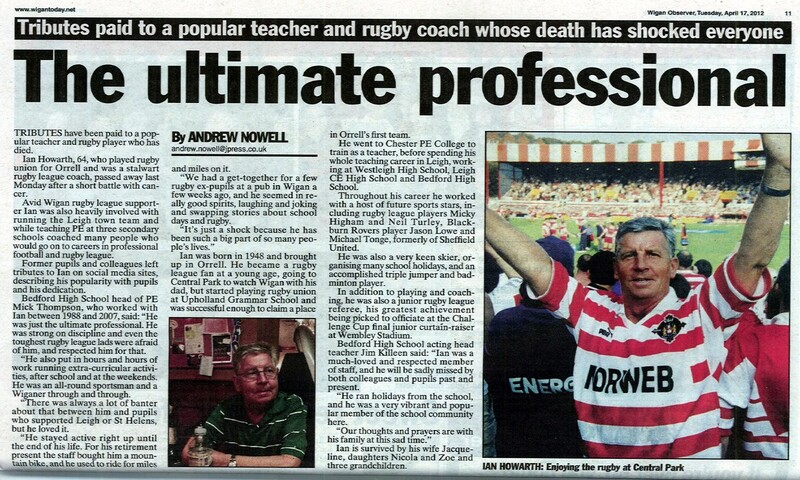 Could I ask you to put the attached obituary to Ian Howarth on to the site. Ian was a great friend of mine and we played rugby all through school together from the under 12’s to the 1st XV. He was the left centre and I was the left wing. He will be sadly missed. Thanks. Sad Email received 22/11/2011 from Katheen Fowler (Ford) - I have just found your site and wanted to contact you with news of a former pupil. My name is Kathleen Fowler (Ford) and I have been married to David Fowler (Adams) for nearly 40 years. We were both at UGS from 61-68 and had a great time. Email received 25/10/2011 from Christy Taylor - I am now back in Phoenix after a rather short trip to the house in Portugal at the beginning of this month. I also spent time in England, visiting with my daughter Beth who lives in Bramhall and Scotland where my brother retired to a few years ago. During the trip, Joan Smith, Sue Banks and myself arranged to meet up in Chester for a day. We had a wonderful time starting off with morning coffee at the Grosvenor Hotel then a beautiful Italian restaurant for lunch followed by walks around town and by the river. The weather was amazing and much catching up on news occurred. It had been 5 years since the three of met up in Edinburgh in 2006. I think we all looked well for our age, all of us having retired now. Our next get-together is tentatively planned for sometime next summer when I hope that Joan and Sue can travel to Portugal to spend some time at my property there. I will be spending 4 months in Portugal next year from March through to the end of July. My husband Rob, who still is working at the University in Phoenix will be visiting a couple of times during that period. Email received 3/08/2011 from Andrea Gaskell- I was Andrea Haydock - friends with Glenys Hughes, Tina Rogers, Julie Unsworth, Christine Macy, Carol Rimmer; amongst others. I left in 1975 to start a brief career in the Civil Service as a Tax Officer, then got married to Dave and had 2 children. In 1998 I qualified as a Primary teacher, after being an Adult Ed Lecturer for 16 years. I now have 3 grandsons and number 4 is on the way in September! I remember: penny socials, Grammar Dances, taking part in a production of Oliver, visiting Kennilworth Castle with French exchange students; visiting Stratford on Avon for a weekend; getting caught climbing out of C3 classroom window when we got locked in one lunchtime; swimming in the reservoirs; pinching bikes to go to the chippy!! Teachers I remember: Peter O'Leary - English; Mrs Allen; Mrs Moritt (PE); Reg Lathom, Gerry Rickards. All in all I quite enjoyed my time there! Email received 6/01/2011 from John Foster - I just thought I'd let you know the sad news that Geoff Winnard passed away on New Years Eve after a long battle with illness. Geoff attended UGS between 1969 and 1976 and will be very well remembered by those who attended the school at that time. The funeral took place at St Lukes Orrell at 12.00 on Tuesday 11th January 2011 and I'm certain that there were many of his contemporaries present who wished to pay their respects. Email received 14/12/10 from Jim Barton - Thank you for letting me have a “prompt” that the new MUGS61 website was underway .. good idea to extend it to all. Some recent sad news I spotted was that Robin Thornber died on 5 December. http://www.guardian.co.uk/stage/2010/dec/12/robin-thornber-obituary I went to Upholland with Robin and, although we were never close chums, he was very notable for his remarkable intellect even then and was one of the rare breed at the time who was accepted at Oxford.